A problem with trends is that some real gems get dismissed the second it's lumped in with the rest. Case in point, I didn't have high expectations for Arthur de Pins' Zombillenium; yet another zombie comic. But what a pleasant surprise. 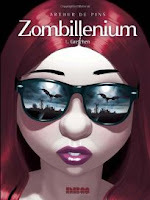 Zombillenium: 1. Gretchen is great fun, a unique story, and superbly drawn. And while there are zombies, they're not the focus. Zombillenium is a monster run theme park. Think Hotel Transylvania meets Disneyland. This particular volume involves Gretchen, a witch intern and Aurelian, a new "recruit." There's some confusion at first whether or not he'll wind up a vampire or werewolf, but he winds up something... cooler, not to mention the reluctant new mascot for Zombillenium which may— if he can be controlled— save the park from lagging sales. So it may not have the most literary of aspirations, but it's witty and cool. Gretchen, for instance, rides a skateboard fastened to a flying broom. She likes to tell people that her father is Robert Smith (of the Cure). Then there's the art. Characters are highly expressive, adding to the humour, but there's hidden depth in the backgrounds, with colouring and watercolours that catch the mood, and brilliantly paced panels, slowing down to nearly identical panels for realizations and tension, but veering from that formula, picking up the pace or dropping stuff in the gutter when needed. Best of all, this works as a single but sets up so much potential for future stories. Glad you liked this! I've read the first two and it certainly is something "completely different".